Section 169 Cr.P.C. : Release of accused when evidence deficient. Section 173(8) Cr.P.C. : Further investigation by police. Police has right to further investigated the case, even after Court takes cognizance of the case. a) Special Judge / Magistrate can order further investigation. b) But Court cannot direct that a particular officer or officer of a particular rank should conduct further investigation. Court can take cognizance of offence on the basis of supplementary chargesheet even though prior permission of the Court by the police to further investigate the case has not been taken. Accused has no right of notice. Applicability of provisions of Section 167 Cr.P.C. during further investigation. a) During further investigation, police can arrest an accused. b) Magistrate can remand such accused to police custody. c) Magistrate cannot issue warrant, with the direction to the accused to appear before the police. For one incident, investigation may be conducted by two agencies. After filing of charge-sheet by first agency the charge-sheet of the second agency will be treated as a further investigation report (supplementary charge-sheet) and not as a fresh investigatoin/re-investigation report. Re-investigation without prior permission of Court is not permissible. After completion of investigation, police submit its report to the Court. Thereafter, some new facts may come to the notice of the police which may necessitate further investigation or re-investigation of the case. Fresh investigation and re-investigation are different terms. Re-investigation:- Re-investigation is started abnitio, wiping out the earlier investigation all together. After re-investigation a fresh report is (or reports are) presented. Police has the right to further investigate the case, even after the Court takes cognizance of the case. For further investigation, prior permission of Court is not necessary. Mere information is sufficient. (a) On the intervening night of 31st March 1967 and 1st April 1967, two sandstone pillars of great antiquity, beauty and value were stolen from Suraj Kund temple, in village Amin, Haryana. They were of the Sunga period (2nd Century B. C.) and their estimated value in the international Art Treasures’ Market, at that time, was around five hundred thousand American dollars. A first information report (F.I.R. No. 72 of 1967) was registered by the Police of Lutana, District Karnal. The pillars were recovered on 2nd May 1967. On completion of investigation a charge-sheet was filed on 3rd October 1967 in the Court of the Ilaqa Magistrate at Karnal, against one Bali Ram Sharma and two others. The case ended in their acquittal on 16th July 1968. (c) During the pendency of the case one Narinder Nath Malik (N. N. Malik) filed an application before the Magistrate alleging that he was a research scholar and requested that he might be given custody of the two pillars to enable him to make a detailed study. At the instance of H. L. Mehra, the then Chief Judicial Magistrate, Karnal and a friend of N. N. Malik, the learned Ilaqa Magistrate gave custody of the two pillars to N. N. Malik on his executing a personal bond in a sum of Rs. 20,000. The order was written by H. L. Mehra himself and signed by the Ilaqa Magistrate. The pillars remained in the custody of N. N. Malik from 1st March 1968 to 27th May 1968. Thereafter, these were to be returned to the Court of the Ilaqa Magistrate, Karnal. After the acquittal of Bali Ram Sharma and others, the pillars were handed over to the Lambardar of village Amin. Later, it came to light that the pillars returned by N. N. Malik were not the original pillars but fakes. Thereupon, First Information Report No.RC.2/71-CIA/SPE/CBI was registered at Delhi against N. N. Malik and H. L. Mehra under S. 120-B read with Sections 406 and 420 Indian Penal Code. After completing the investigation, the C.B.I filed a charge-sheet No.R. C. 2 of 1971 in the Court of Special Magistrate, Ambala, against N. N. Malik and H. L Mehra for the offences under Section 120-B read with Sections 406 and 420, Indian Penal Code. The charge-sheet was filed on 30th December, 1972. (e) On 17th May, 1976, the learned Special Magistrate, Ambala, passed an order directing the framing of charges against N. N. Malik and H. L. Mehra. But, no charges were actually framed as the accused were not present in the Court. (f) On 17th April, 1977, the Public Prosecutor filed an application under Section 494, Criminal Procedure Code for permission to withdraw the case against Malik and Mehra. The Special Magistrate, Ambala, by his order dated 16th May, 1977, permitted the withdrawal of the case and discharged the accused. (i) Between May 1976 and May 1977 several other things happened and the Narang brothers, made their appearance on the scene. Of the three Narang brothers, Om Prakash alias Omi Narang had been living in London since 1970, Manohar Lal alias Manu Narang had been similarly living in London since July 1974 and Ram Lal Narang alone had been living in India. Ram Lal Narang was detained first under the MISA from September 1974 till he was released under orders of the High Court, and later, under the COFEPOSA from 1st July 1975 till the revocation of the internal emergency in March 1977. (ii) The two genuine pillars which had been removed from Suraj Kund temple were traced and found in London in the warehouse of Messrs. Spink and Co. It was suspected that Manoharlal Narang and Ramlal Narang had engaged Balkishan Rawal and Nathubhai Rawal of Delhi to make three sets of fakes and had exported the genuine pillars to London. A First Information Report (R.C.4/76CIU(A)/SPE) was registered by the Superintendent of Police, CIU (Antiquities, SPE/CBI, New Delhi) against Manohar Lal Narang and others for offences under Section 120-B Indian Penal Code read with Sec. 411, Indian Penal Code and Section 25 (1) of the Antiquities and Art Treasures Act, 1972. (h) On 26th June, 1976, N. N. Malik made an application before the Chief Metropolitan Magistrate, Delhi, in case R. C. Number 4/76-CIU(A)/SPE, New Delhi, purporting to be under Section 306 of the Code of Criminal Procedure, 1973, praying that he might be granted pardon. The application mentioned Sections 411, 406 and 420, Indian Penal Code read with Section 120-B and Section 25 (1) of the Antiquities and Art Treasures Act, 1972, as the offences involved. The application was supported by the reply filed by the Superintendent of Police, C.B.I. On 3rd July 1976, the Chief Metropolitan Magistrate, Delhi, granted pardon to N. N. Malik. Before the grant of pardon the confessional statement of N. N. Malik was got recorded by the Metropolitan Magistrate, Delhi. Thereafter, on 19th July 1976, a charge-sheet (R.C.4/1976) was filed in the Court of Chief Judicial Magistrate, Delhi, for offences under Section 120-B, Indian Penal Code read with Sections 420, 411 and 406, Indian Penal Code and Section 25 of the Antiquities and Art Treasures Act, 1972. The case was transferred to the Court of the Additional Chief Metropolitan Magistrate. (j) On 20th July 1976, the Additional Metropolitan Magistrate issued process for the appearance of the three Narang brothers. The learned Magistrate also issued warrants for the extradition of Omi Narang and Manu Narang who were in London. Extradition proceedings were initiated in Britain at the instance of the Government of India. The Metropolitan Magistrate, Bow Street, London ordered the detention of Omi Narang and Manu Narang pending the issue of warrants by the Secretary of State under Section 5 of the Fugitive Offenders Act. A petition for the issue of Writ of Habeas Corpus Ad Subjiciendum was filed in the High Court of Justice, Queen’s Bench Division, London. The Divisional Court directed the release of Omi Narang and Manu Narang. The Government of India filed an appeal to the House of Lords and on 24th March, 1977, the appeal was allowed. Omi Narang and Manu Narang were finally extradited and brought to India on 27th July, 1977. (k) Meanwhile internal emergency was lifted in India in March 1977 and Ram Lal Narang was released. Almost immediately he filed a petition before the Additional Metropolitan Magistrate to drop the proceedings against him, to cancel the extradition warrants and to discharge the accused. (l) The contention of accused was that the entire investigation in First Information Report No. R.C.4/76 was illegal as a case on the same facts was already pending before the Ambala Court and that the Delhi Court acted without jurisdiction in taking cognizance of the case pursuant to a report of police based upon such illegal investigation. (iii) It was a matter for the High Court to decide under Section 186, Criminal Procedure Code. The learned Magistrate also noticed an application filed before him, after the conclusion of arguments, informing him that the case in the Court at Ambala against Malik and Mehra had since been withdrawn on 16th May 1977. On 21st June 1977, two applications were filed in the Delhi High Court under Section 482, Criminal Procedure Code, one by Ramlal Narang and the other on behalf of Omi Narang and Manu Narang who were still in England awaiting extradition. (ii) Quashing of warrants for the extradition of Omi Narang and Manu Narang. (iv) The orders of the Chief Metropolitan Magistrate and the Additional Metropolitan Magistrate taking cognizance of R. C. 4 of 1976 were illegal. (v) The grant of pardon to N. N. Malik was not as per law. (vi) It was also prayed that the proceedings before the Metropolitan Magistrate might be quashed. The petitions were dismissed by the Delhi High Court. The accused feeling aggrieved filed appeals in the Hon’ble Supreme Court. 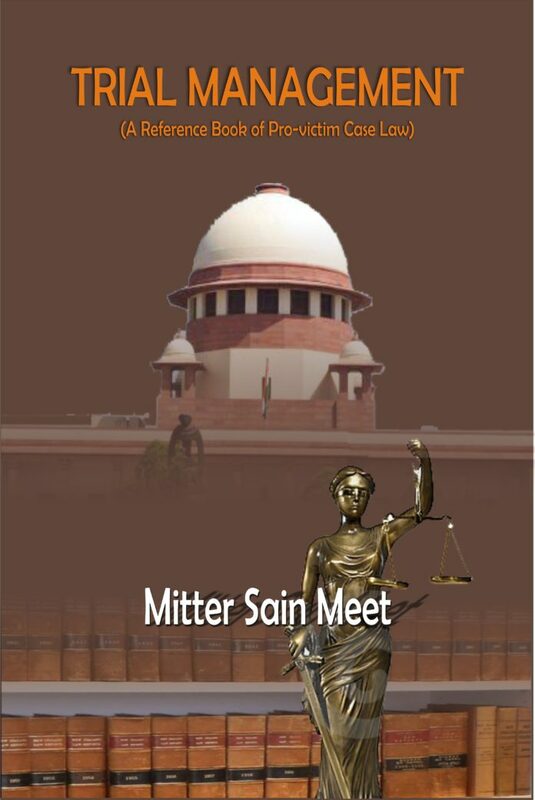 On 1st August, 1977, a supplemental charge-sheet was filed making Mehra as an accused in the Delhi case, the case in the Ambala Court having been withdrawn on 16th May, 1977, as mentioned earlier. Malik died sometime during August, 1977. Mehra also was subsequently granted pardon. (a) The conspiracy and the overt acts which were the subject-matter of the two First Information Reports and the two charge-sheets were the same and, therefore, there was an implied bar to the power of the Police to Investigate into First Information Report No. R. C. 4 of 1976 and the power of the Court at Delhi to take cognizance of the case upon the report of such information. (b) The gist of the conspiracy in both the cases was to obtain possession of the pillars. The offence of conspiracy relating to the obtaining of the pillars having been investigated and a charge-sheet having been filed in the Ambala Court, the Police had no authority in law to start a fresh investigation under the Criminal Procedure Code by registering another First Information Report and to submit a charge-sheet in the Delhi Court for the very same offence. (a) The conspiracy which was the subject-matter of the charge-sheet filed in the Delhi Court was not the same as the conspiracy which was the subject-matter of the charge-sheet filed in the Ambala Court. The circumstance that some of the conspirators were common and part of the case was the same did not make the two conspiracies identical with each other. There was, therefore, no question of any bar against the Delhi Court from taking cognizance of the case based upon the wider conspiracy merely because the Ambala Court had taken cognizance of the case based upon the narrower conspiracy. (b) The statutory right of the Police to investigate into cognizable offences was not fettered and did not end with the submission of a charge-sheet to the Court. The Police had the right and indeed, the duty, to investigate into fresh facts coming to light and to apprise the Court of the same. Whether, after the taking of cognizance by the Court, the right of the police to further investigate the case is barred? Whether, to start further investigation, prior permission of Court is necessary? After the taking of cognizance by Court, further investigation is not barred. For Further Investigation, Prior Permission of Court is not Necessary, Mere information is sufficient. Para “21. ….. We think that in the interests of the independence of the magistracy and the judiciary, in the interests of the purity of the administration of criminal justice and in the interests of the comity of the various agencies and institutions entrusted with different stages of such administration, it would ordinarily be desirable that the police should inform the Court and seek formal permission to make further investigation when fresh facts come to light. Special Judge / Magistrate can order Further Investigation. But Court cannot direct that a Particular officer or officer of a Particular Rank should conduct further investigation. Complainant was a disciple of one Swami Rama, a non-resident Indian, who founded a Trust by name “Himalayan Institute of Medical Sciences” at Dehra Dun. The Trust had a lot of income-tax problems. Complainant felt that the then Commissioner of Income Tax, Meerut, was troubling the Trust and its founder, with frequently issued notices. It was in this context that they approched B.P. Gupta, Chief Commissioner of Income Tax, Kanpur (accused no.1) for redressal of their grievances. Complainant forwarded a complaint to the DIG of CBI, New Delhi on 6-3-1996, complaining that at the behest of accused no.1, the Trust people including the complainant contracted Janardhan Gupta (the son of A1) who demanded Rs. 20 lacs to be paid to his father as bribe and after a lot of naggling, the amount was reduced to Rs.10 lacs. On 8-3-1996, CBI made all preparations for a trap. The team of CBI officers reached the house of one Roshan Lal who was the treasurer of the Trust and waited for the opportune time to hand over the bribe amount to the A1. A microcassette supplied by the CBI to the complainant with which he recorded the conversation between the complainant and Janardhan Gupta (A4) and his father (A1). At the pre-arranged time a bag containing the cash was handed over to Sudhanshu Gupta, another son of A1, (he was accused no.5 in this case) at his residence in the presence of A4. The signal was then transmitted to the CBI officers who made a swoop and surrounded the house and caught A5. The bag containing the cash was recovered from below the bed of the house of the accused A3. The investigation thereupon was commenced by the CBI. When the investigation concluded the CBI filed its final report before the Special Judge, Anti Corruption (Central) Lucknow. In the final report the case was given a totally reverse picture. The CBI exonerated A1, A4 and A5 in full measure and wanted the Court to initiate prosecution proceedings against the complainant for the offence under Sections 182 and 211 of the Indian Penal Code. The CBI took the stand in strident tone that the complaint made by the complainant was not only false but it was aimed at deterring the Income Tax officials from discharging their functions fearlessly. It was a calculated move to forestall the strong measures devised against Swami Rama and the Trust founded by him. (a) To reinvestigate the matter. (b) That the case should be investigated by a DIG level officer. The CBI filed a revision petition in the Hon’ble Allahabad High Court. The High Court set aside the order of the Special Judge on the ground that there was no case for any fresh or further investigation. The High Court also deprecated the direction of the Special Judge for specifying an officer of DIG Rank of the CBI to conduct the investigation. The High Court directed the Special Judge to consider the materials before him once again and to pass suitable orders in accordance with law. The complainant, feeling aggrieved, filed an appeal in the Hon’ble Supreme Court. The contention of the Counsel of the complainant was that the High Court should not have interfered with the order of the Special Judge, particularly when the said order did not contain any final conclusion on the report. It was further contended that all that the Special Judge said was that further investigation should be conducted. At any rate, the CBI recovered 10 lakhs of rupees from the house of the accused A3 and hence a further investigation would have only helped the CBI to know how it reached there and through whom. The Additional Solicitor General submitted that the conclusion of the CBI was based on the materials collected by them and that was filtered at different levels of the organisation of the CBI. The final report was laid only when the CBI was convicted of the conclusions reached therein. Therefore, the order of the Special Judge was not proper. It was further contended that the direction of the Special Judge that a particular police officer should conduct further investigation is also not as per law. Whether Special Judge/Magistrate can, in case of cancellation report, order further investigation? Whether Special Judge/Magistrate can direct that further investigation should be conducted by a particular police officer? Special Judge/Magistrate can order further investigation. Special Judge/Magistrate cannot direct that a Particular officer or officer of a Particular Rank should conduct further investigation – not legal. On 22-6-1990 the Lokayukta police registered a case for the offences arising under Sections 13(1) (e) and 13(2) of the Prevention of Corruption Act, 1988 and filed a ‘untrace report’ (Report U/s 169 Cr.P.C. stating that there is no sufficient evidence or ground to file charge-sheet against the accused) in terms of Section 173(2) read with Section 169, Cr. P.C. on 30-11-1991. The said ‘untrace report’ was accepted by an order made on 11-12-1991 by the Special Judge, as provided under Section 173(4), Cr.P.C. On 7-6-1993 an application was filed under Section 178, Cr. P.C. to recall the order dated 11-12-1991 and seeking permission for investigation. On 17.06.1993, the Special Judge made an order as aforesaid, and allowed the Karnataka Lokayukta to continue the investigation into the offence against the accused in accordance with Section 173(8) of the Criminal Procedure Code and to take all possible steps in consequence thereof, in accordance with law. Feeling aggrieved, accused filed a criminal revision in the Hon’ble Karnataka High Court. Whether after accepting untraced report, Magistrate has power to order further investigation on the basis of fresh material noliced thereafter? (iii) Court can take cognizance of offence on the basis of supplementary charge-sheet even though prior permission of the Court by the police to further investigate the case has not been taken. On 11/12/1991, Bansi Dhar and Sarbeswar Patra came to the village in company of some other accused. They forcibly took away two persons. Subsequently, the dead bodies of the kidnapped persons were found on the road. Police registered the case u/s 302, 201, 120-B IPC etc. The investigation was completed and charge-sheet was filed. The accused filed a petition in the High Court against the order of cognizance. The High Court quashed the said order ‘on the ground of lack of evidence.’ The police further investigated the case, collected more material evidence and filed a supplementary charge-sheet. The Trial Court took cognizance on the basis of the supplementary charge-sheet. The accused challenged that order in the present petition. One contention of the accused was that the police did not take permission of the Court; therefore, the submission of the supplementary charge-sheet was not permissible. Whether prior permission of Court is necessary to start further investigation? Whether Court can take cognizance on the basis of supplementary charge-sheet filed by the police on the basis of further investigation which was conducted in the absence of prior permission of the Court? The Hon’ble High Court held that prior permission of Court to start further investigation is not mandatory. It was also held that Court can take congnizance on the basis of such supplementary charge-sheet. On 22-6-1990 the Lokayukta police registered a case for the offences arising under Sections 13(1) (e) and 13(2) of the Prevention of Corruption Act, 1988 and filed a ‘untrace report’ (Report U/s 169 Cr.P.C. stating that there is no sufficient evidence or ground to file charge-sheet against the accused) in terms of Section 173(2) read with Section 169, Cr.P.C. on 30-11-1991. The said ‘untrace report’ was accepted by an order made on 11-12-1991 by the learned Special Judge, as provided under Section 173(4), Cr. P.C. On 7-6-1993 an application was filed under Section 178, Cr. P.C. to recall the order dated 11-12-1991 and to grant permission for investigation. On 17.06.1993, the Special Judge made an order as aforesaid and allowed the Karnataka Lokayukta to continue the investigation into the offence against the accused in accordance with Section 173(8) of the Criminal Procedure Code and to take all possible steps in consequence thereof, in accordance with law. Feeling aggrieved, the accused filed a criminal revision in the Hon’ble Karnataka High Court. One contention raised by Defence Counsel was that the learned Special Judge if at all wanted to consider the application under Section 173(8) of the Code, should have issued notice to the accused and heard him. Whether after accepting un-trace report and while ordering further investigation notice to the accused is necessary? The accused were facing trial for the offences punishable under Sections 147, 148, 302, 341 r/w. 149 and 120(B), I.P.C. After investigation, charge-sheet was presented in the Court. In the meantime, accused filed a representation with Government of Andhra Pradesh which directed Superintendent of Police, CBCID to further investigate the crime and to submit a report. Accordinly, Senior Police Officer, CID examined a number of witnesses who were acquainted with the facts and circumstances of the case. However, the witnesses who were cited as prosecution witnesses by the police in the chargesheet were not re-examined. The Enquiry Officer concluded that the accused were not involved in the crime. He submitted the report to the Government. It remained pending with the Government for further action. In the meantime, the Magistrate committed the case to the Sessions Court. The accused moved an application before the Trial Court with the request that the record of the Enquiry Officer may be summoned and the accused may be discharged on the basis of the said report. It was further prayed that the statements of the witnesses may be supplied to them as these were required for cross-examining the prosecution witnesses. The application was dismissed by the Trial Court while holding that the record which was relied upon by the prosecution has already been supplied to the accused. The record of the enquiry cannot be summoned. If the accused intended to adduce evidence, they can do that at the time of defence. Feeling aggrieved, the accused filed the petition in the Hon’ble Andhra Pradesh High Court. The contention of the Defence Counsel was that CID, while investigating into the matter examined a number of witnesses, including the witnesses cited by the prosecution. Those statements have to be used by the accused for cross-examining the material prosecution witnesses to prove contradictions. He further submitted that the dismissal of the application will amount to denial of valuable right of the accused to cross-examine the witnesses and the lower Court is not justified in dismissing the petition. The State Counsel contended that the record sought to be produced is not a part of the charge-sheet, therefore, it cannot be summoned and supplied to the accused. Whether accused can claim copies of statements recorded during enquiry to contradict the witnesses during cross-examination? Whether accused can claim further investigation? During further investigation, police can arrest an accused. Magistrate can remand such accused to police custody. Magistrate cannot issue warrant, with the direction to the accused to appear before the police. On March 12, 1993, a series of bomb explosions took place in and around the city of Bombay which resulted in the death of 257 persons, injuries to 713 persons and damage to properties worth Rs. 27 crores (approximately). Over the explosions 27 criminal cases were registered. On completion of investigation a composite charge-sheet was forwarded to the Designated Court, Greater Bombay on November 4, 1993, against 198 accused persons, showing 45 of them absconders, for commission of various offences punishable under the Indian Penal Code, the Terrorist and Disruptive Activities (Prevention) Act 1987, Arms Act 1959, Explosives Substances Act 1908 and other Acts. On that charge-sheet the Designated Court took cognizance and the case registered thereon was numbered as B. B. C. (Bomb Blast Case) No. 1 of 1993. On November 11, 1993, the Government of India, with the consent of the Government of Maharashtra, issued a notification entrusting further investigation in the above cases to the (CBI). In course of such investigation CBI apprehended Mohd. Salim Mira Moiuddin Shaikh alias Salim Kutta, one of the absconders mentioned in the charge-sheet, on July 24, 1993. He made a confessional statement before the DIG. In that confession he disclosed that the accused No. 2 to 7 (hereinafter referred to as the ‘respondents’) took active part in the criminal conspiracy which was the subject matter of B.B.C. CBI moved applications before the Designated Court for the issuance of nonbailable warrants of arrest against said accused and also for the publication of written proclamations. The Designated Court rejected these applications. The CBI challenged this order by filing appeal in the Hon’ble Supreme Court. The Designated Court while dismissing the above mentioned applications held that after cognizance was taken in respect of an offence, process could be issued to the persons accused thereof only to compel them to face the trial but no such process could be issued by the Court in aid of investigation under Section 73 of the Code. According to the Designated Court, though, under the Code, further investigation was not barred but there was no provision therein which entitled the Investigating Agency to seek for and obtain aid from the Court for the same. The contention of the CBI was that since it was making further investigation into the offences in respect of which charge-sheet had earlier been submitted and since the presence of the respondents, who were absconding, was absolutely necessary for ascertainment of their roles, if any, in commission of the offences, it was felt necessary to file the applications. It was further submitted that only after warrants and/or proclamations as prayed for were issued, it (CBI) would be able to take further coercive measures to compel them to appear before the Investigating Agency for the purpose of intended further investigation. According to CBI under Section 73 of the Code and Section 8(3) (a) of TADA the Designated Court was fully empowered to issue warrants of arrest and proclamations. Whether during further investigation, police can arrest an accused? Whether Magistrate can remand such accused to police custody? Whether a Court can issue a warrant to apprehend a person during investigation for his production before police in aid of the Investigation Agency. Para “10. There cannot be any manner of doubt that the remand and the custody referred to in the first proviso to the above (Section 309(2)) sub-section are different from detention in custody under Section 167. While remand under the former relates to a stage after cognizance and can only be to judicial custody, detention under the latter relates to the stage of investigation and can initially be either in police custody or judicial custody. Since, however, even after cognizance is taken of an offence the police has a power to investigate into it further, which can be exercised only in accordance with Chapter XII, we see no reason whatsoever why the provisions of Section 167 thereof would not apply to a person who comes to be later arrested by the police in course of such investigation. If Section 309(2) is to be interpreted – as has been interpreted by the Bombay High Court inMansuri, (1994 Cri LJ 1854)(supra) – to mean that after the Court takes cognizance of an offence it cannot exercise its power of detention in police custody under Section 167 of the Code, the Investigating Agency would be deprived of an opportunity to interrogate a person arrested during further investigation, even if it can on production of sufficient materials, convince the Court that his detention in its (police) custody was essential for that purpose. We are therefore of the opinion that the words “accused if in custody” appearing in Section 309(2) refer and relate to an accused who was before the Court when cognizance was taken or when enquiry or trial was being held in respect of him and not an accused who is subsequently arrested in course of further investigation. So far as the accused in the first category is concerned he can be remanded to judicial custody only in view of Section 309(2), but he who comes under the second category will be governed by Section 167 so long as further investigation continues. That necessarily means that in respect of the latter the Court which had taken cognizance of the offence may exercise its power to detain him in police custody, subject to the fulfilment of the requirements and the limitation of Section 167. Magistrate cannot issue a warrant for the production of an accused before the police. An incident occurred on 13-1-1998 and in that incident both sides lodged their F.I.R.s. On 12-2-1998, local police submitted charge-sheet in one of those F.I.R.s in the Court of the Chief Judicial Magistrate, Varanasi against the applicant/accused and others. Later on, the case was entrusted to C.I.D. The C.I.D. took over the investigation on 9-3-1998 with the permission of the Court. Investigation was going on. When bail application of one of the accused, Sushil Kumar Singh, came up for hearing before the High Court, the Judge noticed that in the course of investigation (by C.I.D.) the witness had changed their versions. The weapons namely Danda, Lathi, Bhala were introduced. Only three accused were found to have used the firearms in the incident. Considering all these developments and improvements made during C.I.D., investigation, he found it expedient that the investigation be done by some independent agency like CBI. The Judge gave such direction. In pursuance to this direction the State Government entrusted the investigation of the offence to CBI. CBI conducted investigation and submitted the charge-sheet before CBI Court at Lucknow on 30th August, 2000. The Special Court (CBI) issued summons to the petitioner and other accused. Feeling aggrieved, the petitioner filed a petition in the Hon’ble Allahabad High Court for the quashing of the impugned summoning order. One contention of the Counsel of the accused was that CBI was authorised to investigate this case after the charge-sheets were submitted by the local police before the Chief Judicial Magistrate, Varanasi. The Court which has already taken cognizance in the matter for the purposes of commitment of the case, alone was entitled to proceed with the C.B.I. charge-sheet. There were two cross versions. One of these versions is pending before the Court at Varanasi and other in the CBI Court at Lucknow. CBI was not authorised to submit independently a charge-sheet before designated CBI Court. The charge-sheet ought to have been submitted by CBI before the same Court (i.e. Court of CJM at Varanasi) which was seized of the case. Whether, after submission of a charge-sheet by the local police and after taking of cognizance by the concerned Court on that charge-sheet, any investigation conducted by any agency, may it be C.I.D. or CBI, would amount to fresh investigation or an investigation called ‘further investigation’, as contemplated by the provisions of Section 173(8), Cr.P.C. The Hon’ble High Court held that after the completion of investigation of an offence by an Investigating Agency, another agency cannot conduct fresh investigation. The submission of a second report on the conclusion of an investigation by the second Investigating Agency cannot be treated as fresh investigation. It will only be a further investigation. The second report will have to be filed in the Court which has already taken the cognizance and will be treated as a supplementary report. On the complaint of one Anu Gupta, an FIR was registered against Vikas Gupta, and others U/Ss 406 & 498-A IPC. After completion of investigation, charge-sheet was filed against all the accused. Thereafter, an enquiry was conducted by the DSP and he found the involvement of only Vikas Gupta in the commission of the crime. Rests of the accused were declared innocent. A supplementary charge-sheet was filed in the Court against Vikas Gupta. Names of remaining accused were mentioned in Column no. 2 of the charge-sheet. The Trail Court framed charges against Vikas Gupta. Thereafter, another application was filed by Vikas Gupta with the SSP Ludhiana with the prayer to conduct a further enquiry. The enquiry was conducted by SP (D) Ludhiana. The new enquiry officer held that the accused Vikas Gupta was also innocent and he sought his discharge from the case. The Trial Court ignored the findings of the SP (D), rejected the prayer for discharge of the accused and proceeded further. Feeling aggrieved, the accused filed a criminal revision before the Hon’ble Punjab & Haryana High Court. The contentions of the Defence Counsel was that the Hon’ble Supreme Court, in a number of such type cases has desired that ordinarily the prior permission of the Court should be obtained. But such direction is only directory. In a case, where such permission is not sought, supplementary charge-sheet cannot be discarded. Para “14. ….. It is manifest that the submissions made by the learned counsel for the petitioner as such cannot be accepted because that would not advance the cause of justice and would lead to anomalous situation as had happened in the present case. The police had already filed the challan and thereafter the matter was re-investigated by Hardev Singh, Deputy Superintendent of Police who found that involvement of other accused except the petitioner was no substantiated and consequently taking into account that report the learned Magistrate had decided to frame charge against the petitioner-accused only under Sections 406 and 498-A, IPC. Thereafter, on the application filed by the petitioner the police again re-investigated the matter and sought to exonerate the petitioner-accused as well. It is for that reason that in K. Chandrasekhar v. State of Kerala (SC) (supra), the Hon’ble Supreme Court has clearly observed that Police has a right of “further Investigation” under subsection (8) of S. 173 of the Code but not “fresh Investigation” or “re-investigation”. Surinder Nath Singh @ Bharat Singh v/s State of U.P. 2001 Cri.L.J. 1745. JC Chitharanjan Reddy v/s State of A.P., 2005 Cri.L.J.2484. Ghanshyam Jena v/s State of Orissa, 2003 Cri.L.J.4794.